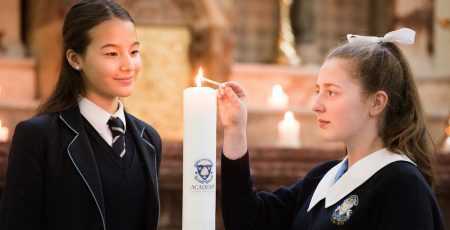 The Academy of Mary Immaculate is a Catholic College in the Mercy tradition and a member of the Institute of Sisters of Mercy in Australia and Papua New Guinea (ISMAPNG). We draw strength from the rich heritage and charism of the Sisters of Mercy and invite our community members to encounter this spiritual tradition based on hope, love, integrity, truth, mercy, justice, love of God, and love of neighbour. We express sacramental life by being inclusive to the diversity of gifts and talents found in our students, staff, and parents. And we celebrate as one Eucharistic community by sharing the sacrifice of giving and receiving. Formally, our liturgy program extends to daily morning homeroom prayers, College assembly prayers, year level retreats, weekly Tuesday morning mass, and whole-of-College mass for Mercy Day and the beginning or conclusion of the school year.